The often-comical repartee between these two actors makes episode two worth watching over and over again…and keeps the action moving rapidly along without its being too dark. Sa Do Chan meets his match? Do Chan’s posse arrives just as the gang of thugs race down the outside steps. Meanwhile, Do Chan and Ha Ra go up the elevator, with Do Chan continuing to pretend he’s Joon So. When the doors open, Do Chan disarmingly grins, saying he was really glad to see her today. But he’s got another appointment and he’ll buy her dinner some other time. She gives him a blank stare. When he walks towards a door, Ha Ra says that’s where the machines are stored. Do Chan says, “I know,” and turns around to the double glass doors. He can’t find any door handles and, looking through the doors from one side to the other, doesn’t see anyone. He then tries to pry the doors apart. Throughout, Ha Ra stands, arms folded across her chest, in front of the elevator. Finally, she says, ‘It doesn’t open.” Do Chan, turning and pointing into the office, repeats, “It doesn’t open.” Striding quickly to him, she pats his chest while he backs up again the doors with his arms spread and eyes closed “Even if you’re that glad to see me, people are watching,” Do Chan says with a slightly lascivious grin. Moments later, she grabs his phone, saying she’s confiscating it and that she’s “truly glad to see you, Sa Do Chan.” He replies with a look that says, What!?! How!?! Do Chan finds himself in an interrogation room where Ha Ra tells him she knows about his con games and why he doesn’t have a criminal record. He says his being there is all a misunderstanding, that he’s really Joon Soo. She doesn’t buy it and leaves him alone in the room. Left alone, he ponders how she knows his name and who she is. In answer to his questions, a flashback shows her sitting on the edge of a desk looking at facial profiles of men who look enough like Joon Soo to replace him in meeting with Nam Seung Tae. One by one, she passes on the faces, until Do Chan’s appears. Meeting offsite with a policeman, she learns he’s an infamous conman with a genius IQ of 168 and only picks out ones to con “who can’t report him to the police even after being defrauded. He defrauds them, then disappears like the wind.” As a result, he has no criminal record. She decides he’s perfect for what she has in mind and she needs him. She asks the policeman to bring him to her and is surprised when she learns he’s coming there on his own. When she sees him in the lobby, she then decides to stage her own rouse to trap him. From the observation booth, Ha Ra and her boss discuss how much he looks like Joon Soo…as if they were twins. 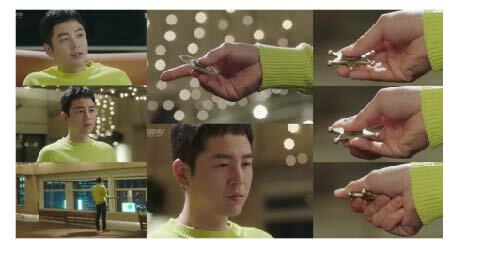 Ha Ra’s boss is scared of the scheme she’s got in mind, but she considers Do Chan a gift from God. When she goes back into the interrogation room, Do Chan continues to pose as Joon Soo, trying to intimidate her. But no such luck. He, however, doesn’t give up and throws out a lengthy argument on the real versus the fake. She still doesn’t buy it. So he decides to make a deal with her. She asks him to pretend to be Baek Joon Soo for one operation: meeting with Nam Seung Tae and getting the evidence Joon Soo was after. Do Chan argues against the idea but finally agrees. Ha Ra’s grudging admiration of Do Chan shows signs of growing when Do Chan meets Nam, while Ha Ra and her boss observe from their car. Nam seems suspicious at first, not knowing of the switch, but finally tells Do Chan the “item” is hidden in the Spanish Cultural Center beneath the Don Quixote statue. Nam also tells Do Chan that his cousin will give him the password to the hidden safe and hands him a photo of the boxed item as well as telling him he gave up 5 million won for this. After Nam leaves, Do Chan wonders aloud, with eyes gleaming, what valuable item the small box contains. A diamond? Receiving no answer he decides to leave when Ha Ra tells him to wait a minute and asks her boss to call and check Joon Soo’s condition. Told that Joon Soo will likely remain unconscious for a few more days, Ha Ra then proposes that Do Chan continue the switch pose and help them retrieve the item. At first he refuses, telling her she has “a really bad habit of speaking from both sides of her mouth” (going back on her word). Although Ha Ra threatens him, he defies her. Nevertheless, a few paces away, he stops and returns to the car. He tells them he has one condition: he’s allowed to see Joon Soo for himself. They agree. Although Do Chan’s posse argues against his continuing to play Joon Soo, he tells them not to worry. The game is now afoot! Do Chan meets Ha Ra and her boss at a darkened, empty café to plan their strategy. While both Ha Ra and her boss remain clueless on how to legally obtain the item, Do Chan hatches the perfect plan: a crime scene. In another imagined scene, Do Chan explains he will enter the Museum where he will get into an imaginary fight with a fake protester. Although Switch has many funny scenes, this one is among the best. 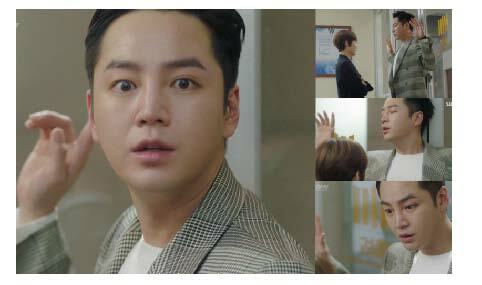 The scene is one that only Jang Keun Suk, with his comic and dance abilities could perform. Do Chan, after a light tap to his chest by the fake protestor, lightly dances across the floor to fall gracefully next to the statue. He next yells his discovery of a bomb and everyone rushes to the exits. Thereupon, a fake bomb squad arrives as do Ha Ra and her boss and the item is confiscated. 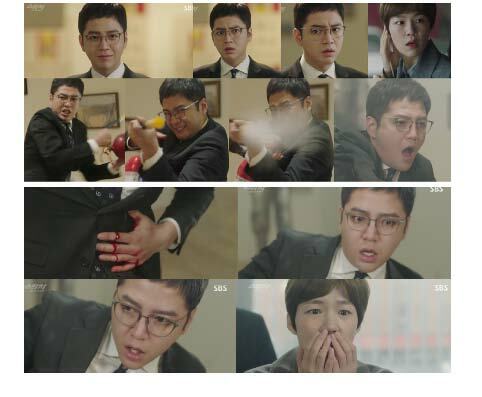 Ha Ra enthusiastically agrees while he boss says, “It’s an idea that could never come out of someone who studied in a proper school system.” However, later Ha Ra’s boss tries hard to dissuade her, but she remains adamant and won’t let her boss back out either. The scene shifts to Geum Tae Woong in his office. Kim Sil Jang, Geum’s captain, has been trying to find Nam but with no success. He still assumes Joon Soo is dead, so the threat of the item being given to him no longer exists. Geum remains unconvinced of Joon Soo’s death and tells him Nam must be found along with the item. They will decide later whether to kill Nam or not. The next day, Do Chan and the two prosecutors arrive at the Museum. Ha Ra’s boss tries again to leave. Ha Ra stops him. Do Chan shakes his head in disgust and leaves for the Museum. The receptionist signals the safe’s password as he walks by. After entering the room with the statue, the fake protestor arrives, yelling, “Blow it up! Blow it up!” But before their fake fight can commence, a gang of thugs, carrying baseball bats, walks in. The leader yells, “Hey, Fake prosecutor.” He says they were the gang at the gambling casino Do Chan raided. A fight ensues, and Do Chan gets knocked across the floor. Out in the car, Ha Ra and her boss are listening to everything. When Do Chan, spraying fire extinguisher at the gang, says he’s being attacked, the two prosecutors rush into the museum. Just as they arrive in the room, the gang leader stabs Do Chan. Bleeding from the stab wound, Do Chan drops to the floor. An ambulance arrives and takes Do Chan away. Ha Ra, then, runs back into the museum to see the statue laying on the floor and the lid of secret safe open. Both she and her boss discover the item’s box remains in place. She picks it up and starts to open it. Meanwhile in the ambulance, Do Chan sits up. The ambulance crew is, in fact, his three accomplices…and they’ve just pulled another switch. Learning of the apparent value of the item from Nam, Do Chan hired the gang of thugs to help him steal the item. Grinning at each other over the successful switch, Do Chan grabs the medical bag and again sardonically repeats that their country’s prosecutors, blinded by their desire for success, have no interest in con men like them. Ripping open the bag, Do Chan lifts the small box out of the bag. Seconds later, Ha Ra lifts the lid on the box she holds, only to find it empty. She screams, “Sa Do Chan!! !” Meanwhile, Do Chan, having opened the original box, stares into space. Wow !!! As read the recap I want more ti having a great time. I can't stop watching the episode and then coming back to read the recap again and again. Love it love it. Thank you sissies.